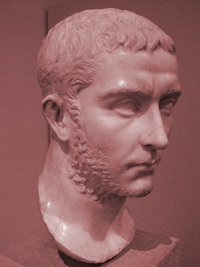 Gallienus was the son of the Emperor Valerian and his co-ruler. When Valerian was proclaimed emperor by the military and approved by a senate pleased to vote in one of their own, they also accepted his son as co-ruler. Valerian would rule the east, Gallienus would rule the west. Unlike his father in the east, Gallienus halted the persecution of Christians and overturned his fathers anti-Christian policies. His father was captured while defending against king Sapor of Persia in 260 and skinned alive. A crushing defeat and humiliation the likes of which had never been seen. In his 15 year rule Gallienus proved himself a worthy general knowing when to fight, when to compromise, and when to cut his losses. His reign was an endless battle to keep the empire together or to protect the frontiers from Germans, Franks and Persians or to bring stability to the troublesome provinces. During his rule Italy was hit by plague, the empire was in turmoil with growing bad blood between the emperor and the senate, revolts, coups, and fighting back rivals. There were numerous usurpers, all of which he put down save the general Postumus who killed the emperors young son, as well as the praetorian prefect whose charge he was in, over a dispute concerning the distribution of recovered loot and proclaimed himself Emperor. Gallienus made several attempts to to remove Postumus who had set up a Gallic Empire in Germania, Gaul, Britain, and Spain but was unsuccessful. In the last attempt Gallienus was injured by an arrow and was forced to retreat, he never gained the personal revenge that, according to one source, drove him to challenge Postumus to single combat and he never was able to reunify the empire during his lifetime. Gallienus patronized a cultural movement which collectively is known as the Gallienic Renaissance which saw a renewed affinity with Hellenistic culture and Neo-Platonic philosophy. The Hellenic character of much of the Gallienic Renaissance is stressed in the emperor's trip to Athens where he, likely in imitation of Hadrian, became eponymous archon and received initiation into the Eleusinian cult of Demeter. As an illustration of the tenuous nature of the empire Gallienus ruled he issued a series of coins honoring nine deities as protectors of the emperor showing himself with the animals that represent these deities. He issued the "animal series" in an attempt to gain the protection of these gods and relief from the tumultuous events of his reign. In 268 he faced another revolt led this time by his cavalry commander Aureolus who was based in Milan. Aureolus had offered his services to the Gallic usurper Postumus in the hopes he would take this advantage to march on Rome and remove Gallienus from power. 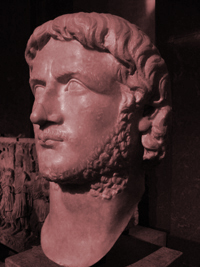 Postumus did not act leaving Aureolus to his fate and Gallienus traveled to Milan to crush the rebellion. During the siege of the city he was lured away from the city on a false pretext by two future emperors, Claudius and Aurelian, and assassinated. The emperor's brother Valerian and young son Marinianus were also murdered. He was Succeeded by Claudius II.